Broad Beans are also known as Fava Beans, English Beans, Horse Beans, Field Beans, and Windsor Beans. Getting its name from the wide, broad pod in which it grows the plants is very hardy and can adapt to a variety of climates. Broad beans are good nitrogen fixers, and will fix all of their nitrogen needs with plenty left over for crops that follow. The broad bean has strikingly square sturdy stems. The leaves are divided into leaflets, quite large and rounded. 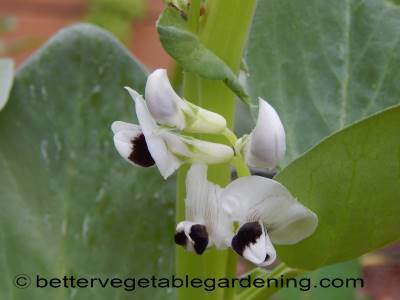 The broad bean flowers are mostly white with irregular dark areas at the base. Depending a lot on variety pods can be up to 10 inches long and contain 4 to 6 flat, oval seeds that can be white, yellow, green, or reddish. 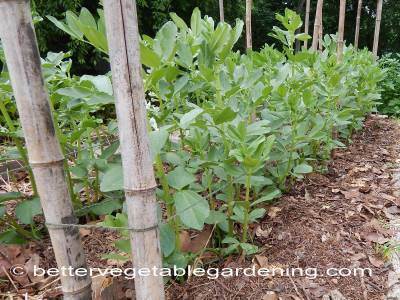 Broad beans are the exception to the rule when it comes to best growing conditions for beans. Unlike all other bean varieties that insist on warm to hot weather, growing broad beans require a long, cool growing season. Temperatures ranging from 60° to 65°F are best but they will grow in temperatures as low as 40°F (4 C) and as warm as 75°F (24 C). 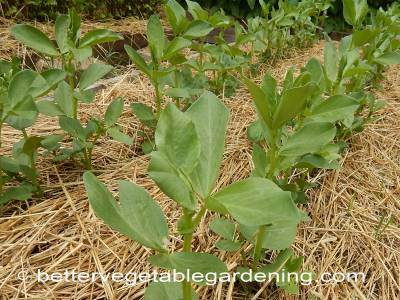 In most areas planting broad beans should be done as soon as possible in the spring, after the last frost. Direct sowing seeds is the best option and they usually germinate in 7 –14 days. Depending on variety and conditions it will take 65 to 100 days to reach full harvest. 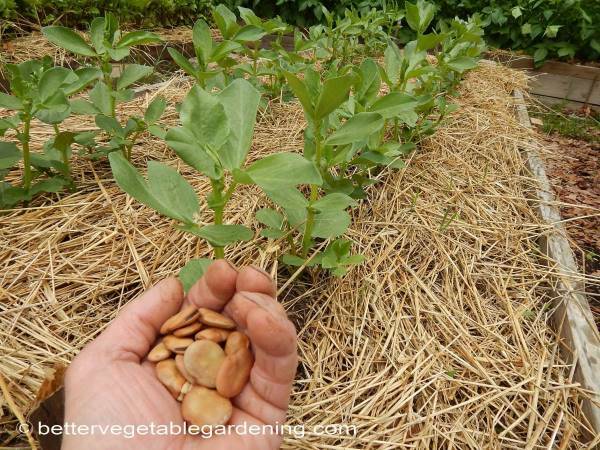 In areas that have mild winters broad beans can be planted in late summer or early fall for harvesting in late winter and spring. Typical vegetable growing soil conditions are what this plant likes best, a loose, well-drained, moist soil that is rich in organic matter. They don't mind it cool, but don't do well in soggy water logged conditions. For single row planting, sow beans about two inches (5cm) deep and four to six inches (10 - 15 cm) apart. Space rows 18 - 30 inches (45-75 cm) apart. For planting double rows spaced 10-12 inches (25 - 30 cm) apart. Sow seeds same as single rows, four to six inches (10 - 15 cm) apart to allow for thinning to strongest plants. When growing broad beans it is important to thin out the plants, this will ensure good airflow and reduce the chances of fungal disease. For single row planting, thin to strongest plants approximately 8 -10 inches (20 - 25 cm) apart. For double row plantings, thin to 12 inches ( 30 cm ) apart in each row. Weed control and good moisture levels can be achieved by mulching heavily as soon as possible after germination. While Broad beans are good nitrogen fixers, and will fix all of their nitrogen needs with plenty left over for crops that follow, don't forget nitrogen is only one of the many nutrients required for healthy plant growth. Before planting add aged compost or well-rotted manure to the planting beds or a good organic 5-5-5 fertilizer. If beans have not been grown in the planting area before consider inoculating the soil with rhizobia bacteria to encourage nitrogen fixation. As the plants grow you will need to support them to prevent the fragile stems from bending or breaking. Also to keep the developing beans off the ground and allow for easier harvesting. There are several different methods that can be used. From simple stakes driven into the ground tying together two or three plants. Support from stakes and string as in this photo are also simple and effective. Dwarf varieties are well worth considering, especially on windy or small sites because they will need less space and less staking. However even these varieties will need a little support, because the pods can become heavy. Aphids, bean leaf beetle, beet and potato leaf hopper, cabbage looper, cucumber beetle, cutworm, European Corn Borers, Japanese Beetles, Mexican Bean Beetles, slugs, white fly. 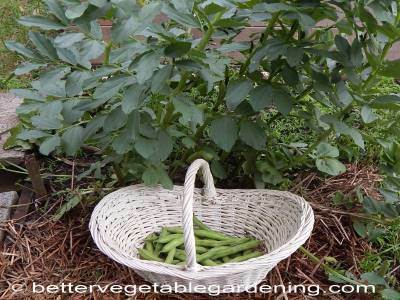 There are three basic ways to harvest and eat broad beans. Broad bean pods mature from the bottom of the stalk up similar to Brussels sprouts. 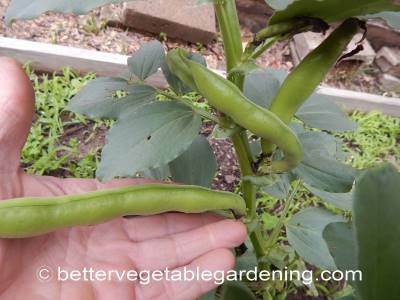 Start harvesting the lowest pods for fresh use like snap beans when seeds are about the size of a pea. The next stage of using is as green shelled, when the beans are allowed to mature more but not to the point of dried, and cooked green. Finally pods can also be allowed to mature and harvested as dried beans. For short term storage whole broad beans will keep in the refrigerator for up to 1 week. When storing for longer term Broad beans can be frozen, canned, or dried.